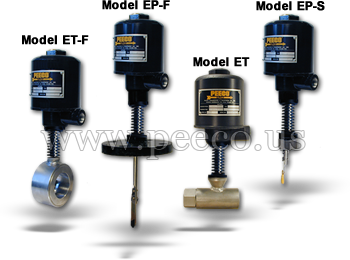 Peeco High Temperature flow switches are specially designed for use at elevated temperatures, the PEECO flow switch can be supplied with a variable length convoluted stainless steel body extension. This "finned" stainless steel body extension will protect the electrical contacts and permit rapid heat dissipation from process conditions. When used in conjunction with our high temperature micro-switch, this flow switch provides superior performance at temperatures other switches only dream about. 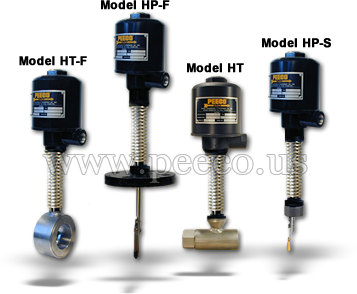 Available on explosion-proof, non-explosion proof and high pressure models. All explosion proof models are rugged, heavy duty units exceeding all UL Code requirements. Each of the four basic styles are adaptable to many other fittings and configurations. Utilizing 1/4" thick Heat treated aluminum cover (shown at right) with 5 fully engaged threads, these units are designed to encapsulate any internal explosion. All explosion proof models meet Class 1, Group D requirements for use in hazardous locations; all NEMA classifications available. The housing & cover are both made of heat treated aluminum T-356 and are epoxy coated (for extra protection). Other classes and groups available. Conduit outlet: 1/2"NPT on all models; 3/4" and metric sizing available. 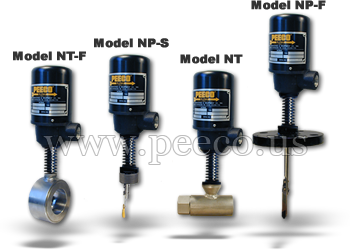 Encompassing all the features and reliability of our more popular Explosion Proof models, these units are furnished with a slip-on steel cover. This .062 thick housing is NEMA 4X weather proof, by utilizing a special "O" ring seal fitted into a mechanical groove in the body; a standard on all of the non-explosion proof models. The housing & cover are both made of heat treated aluminum T-356 and are epoxy coated (for extra protection). Each of the four basic styles shown are adaptable to many other fittings and configurations. 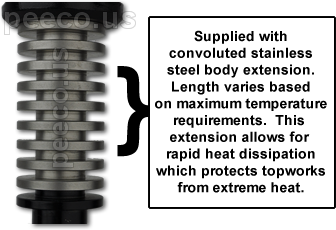 Utilizing ¼" thick Heat Treated aluminum cover with 5 fully engaged threads, all units are designed to encapsulate any internal explosion. In lieu of a bellows assembly a solid rod extends through a flexure tube brazed or welded into a S.S. ball fixture. Unit has been successfully field tested up to 10,000psi. Wall thickness of the flexure tube will vary with pressure requirements. This model is recommended for all pressures over 600psi. Each of the four basic styles shown are adaptable to many other fittings and configurations.